This post was shared via CopBlock.org’s submit page by Ken Womble. For a long time, police have controlled the information surrounding an arrest. The perp was always in the wrong, the police were always in the right, and order was always maintained. If injuries were ever sustained by the suspect or cop, it was caused by the suspect’s initial aggression (and usually was the act of said suspect using his face to assault the cop’s fist). When the case made its way into court, the police swore that the suspect’s appearance “fit the description.” The cops “recovered” drugs from the suspect’s “person.” And the kicker – the suspect “flailed his arms in an attempt to prevent the police from affecting his arrest.” For generations, judges have accepted almost every base statement of “fact” uttered by the prosecutor on behalf of the cops, because their only option was to believe it or put themselves out there as a judge who thinks cops might occasionally lie. But the tides seem to be turning and the only verifiable reason for that is the cameras that capture what is actually going on out there. Police are now potentially surrounded by either surveillance cameras and/or bystander cell phone cameras. While only a fraction of police activity is caught on video, it has still been enlightening. Video showed Eric Garner being choked to death by a number of Staten Island cops. Video showed Michael Slager shoot Walter Scott repeatedly in the back. Video showed cops exit their car and immediately shoot Tamir Rice dead. Video showed John Crawford III being gunned down by the police in an Ohio WalMart. Video showed my former client, Jaleel Fields, being bullied by the cops right before he was arrested for bullying them. While none of these videos have led to suitable justice for the police involved, it has informed the public at large that the truth often lies far from what the police say. Video has shown the majority of white America what the majority of black America has seen with their own eyes for decades. But for every video that ends up on CNN and incites national protest, there are hundreds of mundane recordings that merely show a person being arrested. People on either side of the divide will see what they want to see. Those who support the reform of the criminal justice system will see a man being assaulted by the police and arrested for no reason. Those who support the police will see a criminal suspect resisting lawful arrest and a reasonable use of force by the cops. That debate will rage because the video simply does not provide enough context to know why this man was stopped and eventually arrested. However, there is something missing from this video, and missing from so many videos like it that must be addressed. At no point does the man invoke his right to counsel. The value of having video of the defendant invoking his right to counsel cannot be overstated. In the vast majority of hearings concerning the voluntary or involuntary nature of a defendant’s confession, the cop says it was voluntarily given and the judge believes him. Assume, in such a case, the defendant has told his attorney that he asked for an attorney when he was arrested. If this were true, then (for the most part) statements made by the defendant after he asked for an attorney would be inadmissible at trial. The problem is, since there is no video or witnesses, the only way to get that information to the hearing judge is to have the defendant testify. While defense attorneys can differ on the wisdom of having their client testify at trial, there is almost complete consensus about when to let a client testify at a pre-trial hearing – NEVER. What this practically means is that evidence of a suspect invoking his right to counsel almost never sees the light of day in a pre-trial hearing. All of that can change if the person being arrested starts using the cameras to his legal benefit. Sure, telling everyone who has gathered around your arrest that the cops are harassing or illegally arresting you will get the crowd riled up, but it will have the opposite effect on a judge. Going back to the video of the man being arrested, if that video showed him saying loudly and clearly, “I want a lawyer,” then a judge will have a very different reaction to that. First, the video itself is evidence which can be introduced through the DA’s own witnesses, the cops. This means that the most important piece of evidence for the defense is introduced without the client having to testify. Second, it makes it almost impossible for the prosecution to get a station house confession, real or fabricated, in at trial. This is one of those videos. It was taken today right in front of our office. We are, at the very least, practicing what we preach. 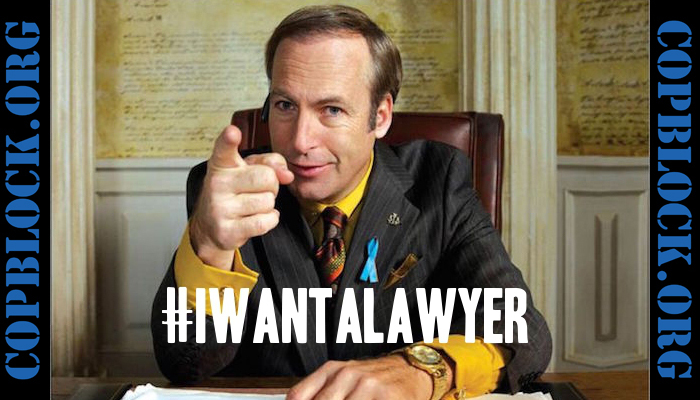 Say you want a lawyer. Say it with your mouth.